Our Valentine’s Day special has grown over the years from weekend special into a month-long package – so much so that this year our February is for Romance package was named one of the Top Ten Romantic Getaways. As most of our guests know, our daily breakfast menu, as well as our afternoon refreshment menu, changes from moment-to-moment, so who knows what we’ll be serving while you’re here (reasonable requests may be possible, if received in time). However, it is very likely that, especially in February, we’ll have some chocolate on the menu! Last year, for our Flavors of Freeport dessert, all the local B&Bs had agreed to serve a Julia Child dessert, in honor of the (then) recently released film, Julie and Julia. As our contribution, Ruth prepared a wonderful Chocolate Almond Cake (yes, that is the cake from the film) from Mastering the Art of French Cooking. 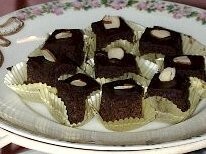 For the event, we cut the cake into bite-sized pieces as shown in the photo, but of course you can serve it however you like it! For all who were not able to be here for the 2010 Flavors of Freeport (by the way, did we mention that the 2011 Flavors of Freeport is March 25-26? It’s not too late to make plans to be here! ), below is the recipe from Julia Child, with some minor alterations by Ruth! Butter and flour cake pan (pan should be 8 inches in diameter and 1 1/2 inches deep). Set the chocolate and rum or coffee in a small pan, cover, and place (off heat) in a larger pan of almost simmering water; let melt while you proceed with the recipe. Measure out the rest of the ingredients. Cream the butter and (the 2/3 cup of) sugar together for several minutes until they form a pale yellow, fluffy mixture. Beat the egg whites and salt in a separate bowl until soft peaks are formed; sprinkle on the 1 Tbsp. sugar and beat until stiff peaks are formed. With a rubber spatula, blend the melted chocolate into the butter and sugar mixture, then stir in the almonds, and almond extract. Immediately stir in one fourth of the beaten egg whites to lighten the batter. Delicately fold in a third of the remaining whites and when partially blended, sift on one third of the flour and continue folding. Alternate rapidly with more egg whites and more flour until all egg whites and flour are incorporated. Turn the batter into the cake pan, pushing the batter up to its rim with a rubber spatula. Bake in middle level of preheated oven for about 25 minutes. Cake is done when it has puffed, and 2 1/2 to 3 inches around the circumference are set so that a needle plunged into that area comes out clean; the center should move slightly if the pan is shaken, and a needle comes out oily. Place the chocolate and rum or coffee in the small pan, cover and set in the larger pan of almost simmering water. Remove pans from heat and let chocolate melt for 5 minutes or so, until perfectly smooth. Lift chocolate pan out of the hot water, and beat in the butter a tablespoon at a time. Then beat over the ice and water until chocolate mixture has cooled to spreading consistency. At once spread it over your cake with spatula or knife, and press a design of almonds over the icing.